A-book is a handy digital address book. This software features many great options that make A-book an essential tool for business and personal life. 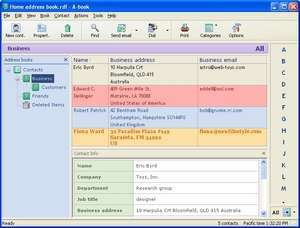 Like envelope and label printing feature that lets you instantly create and print envelopes addressed to a person you select from your A-book entries. Or built-in dialer that lets you dial any selected phone number right from this application. A-book 3.1 is a shareware program and can be used as a demo to try the software until the free trial period has ended. A full version of the program is available after the trial period ends. For security reasons, you should also check out the A-book download at LO4D.com which includes virus and malware tests. Additional screenshots of this application download may be available, too. 1.33 out of 5 based on 3 ratings.